What better way to celebrate the first day of summer (yay!!!) 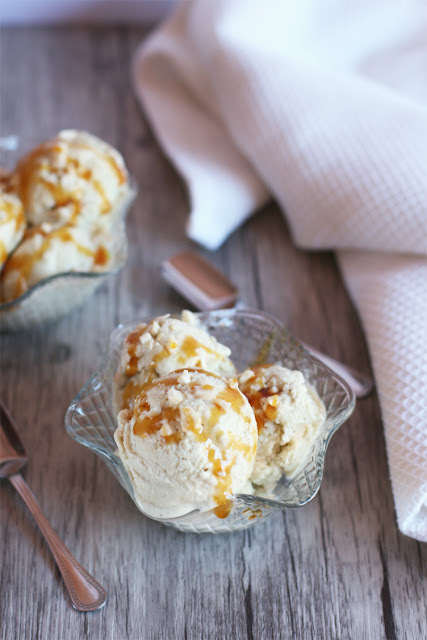 than with this creamy and delicious ice cream?! I know, I know...there are many bloggers out there that have already published quite a lot of ice creams recipes since the beginning of spring; I've seen so many amazing and drool-worthy pics on Instagram...now all I want is to eat homemade ice cream every single day til the end of summer. As usual I wanted to write this post before but I've been hella busy these days (what's new) and when I finally sit down and try to do some blogging tasks it's way past my bedtime. The dark circles under my eyes are telling me that I should go to bed earlier, cause staying up till the wee hours in front of a computer screen is not what my skin needs right now. I need to take it easy, learn to relax and spend some time (even if it's just 5 or 10 minutes) doing something just for me like drinking a green juice while reading a mag, doing my nails or simply a nap. 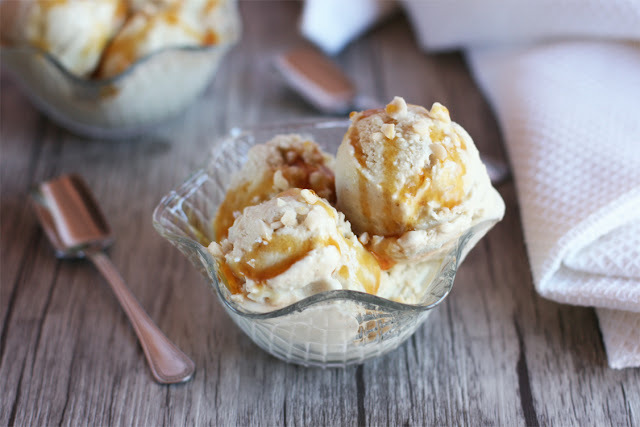 Like I've said again, I'm on a serious ice cream kick and this summer I'm planning to do all those crazy flavor combos I've had in mind since last year and have some fun with my ice cream maker. 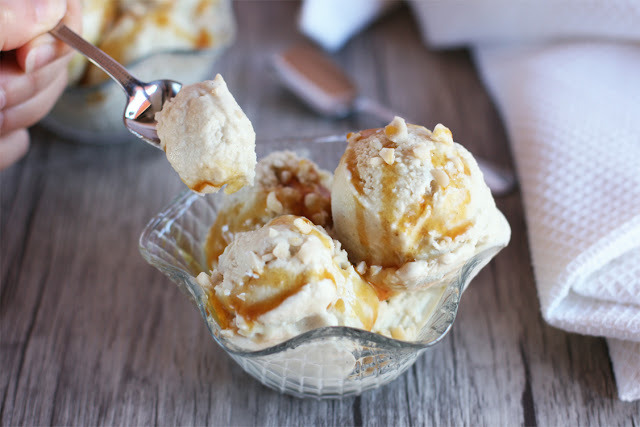 Homemade ice creams don't contain those indecent amounts of sugar, syrups and unhealthy fats; plus if you choose the right ingredients they can actually be good for you. 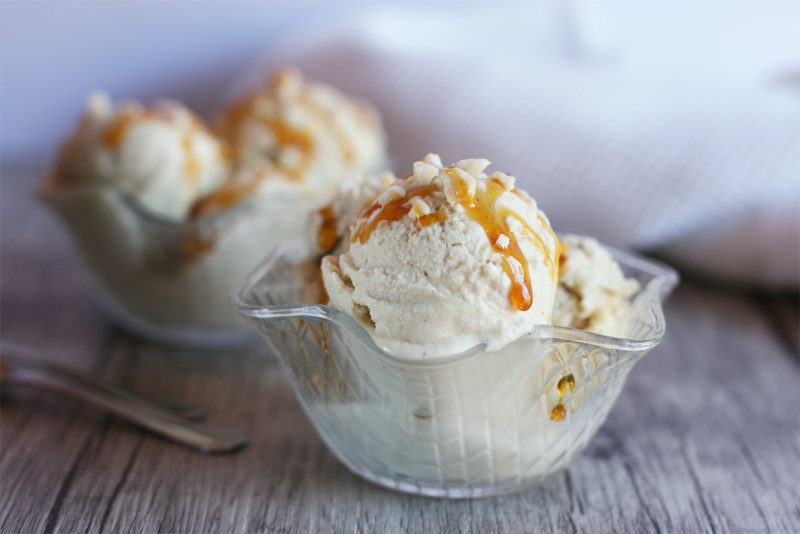 I love the simplicity of this vanilla ice cream: it's super easy to make, you can add whatever topping you desire cause it pairs really well with almost anything and it's deliciously creamy! Since the 'cream' in this recipe is the full-fat coconut milk I thought the perfect addition would be a generous drizzle of coconut syrup (so darn yummy) and some chopped almonds, it doesn't need much to be a great dessert. 1 can full-fat coconut milk (14-ounces/400 ml), at room temperature. 3/4 cup raw cashews (soaked overnight). 5 tablespoons light agave syrup. Drain and rinse the cashews. Pour the coconut milk into a blender and add in the cashews, agave syrup, vanilla extract and vanilla powder. Blend on high speed until creamy and smooth; you might need to stop and scrape the sides of the jug. Make sure the are no bits of cashew visible. Taste and adjust the sweetness, I think 5 tablespoons of agave syrup give the right amount of sweetness but it depends on the liquid sweetner you use. Maybe if you use pure maple syrup you'll need less. Pour the mixture into an airtight container and let it cool in the fridge for about an hour, it is very important our ice cream base is very cold before churning. 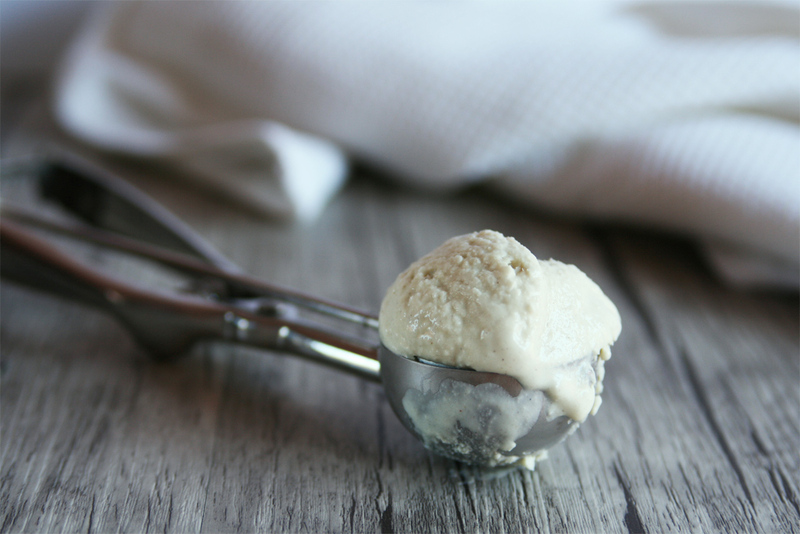 Once chilled, pour the mixture into an ice cream maker and prepare according to the manufacturer's instructions. For example, the bowl of my ice cream maker takes at least 24 hours to freeze and usually I churn my ice creams for 30-35 minutes. 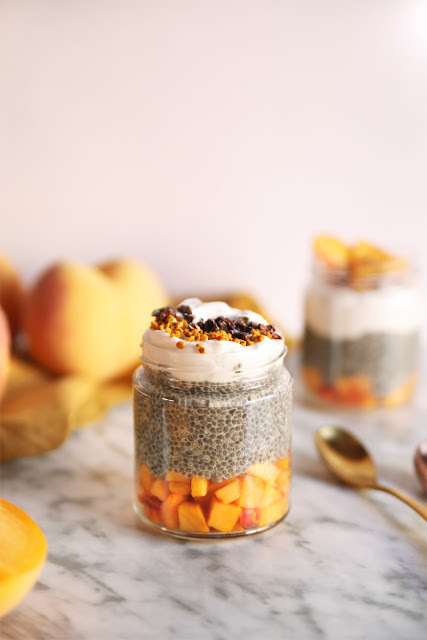 Transfer to a sealed container and freeze until ready to serve. Let the ice cream thaw before serving but check the consistency after 5 minutes because if it's a hot summer day it might need only 5 five minutes to get soft. I just laid my eyes on a (very) expensive ice cream maker that doesn't require to place the bowl in the freezer before churning your ice cream base...but it's quite big and my kitchen is already full of gadgets and so cluttered! I'll follow your advice and try to relax a bit. You know exactly how to strike right at my cravings- I ADORE those luscious, creamy scoops! 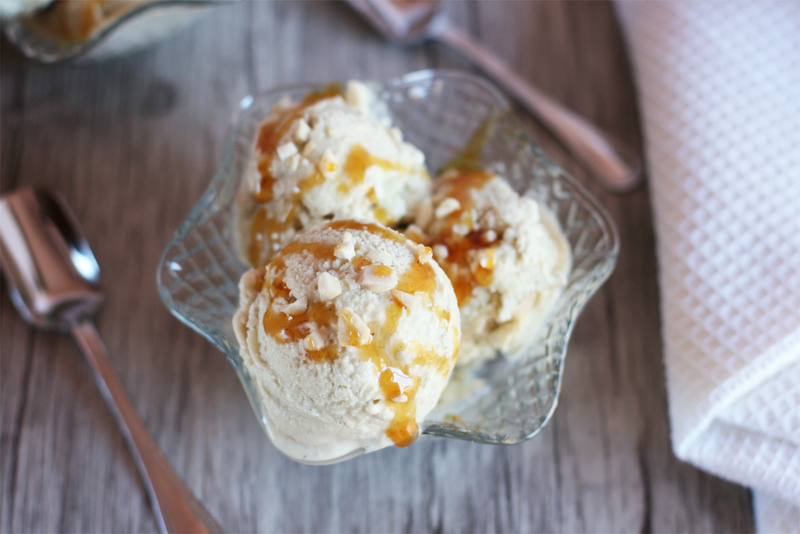 I've been churning out new ice cream flavors left and right, but I can always go for a comforting bowlful of vanilla. I sure wish I had some of this waiting for me in the freezer right now.